Mount Bromo - Tengger National Park is named after occupied by Tenggerese people as inhabitants. 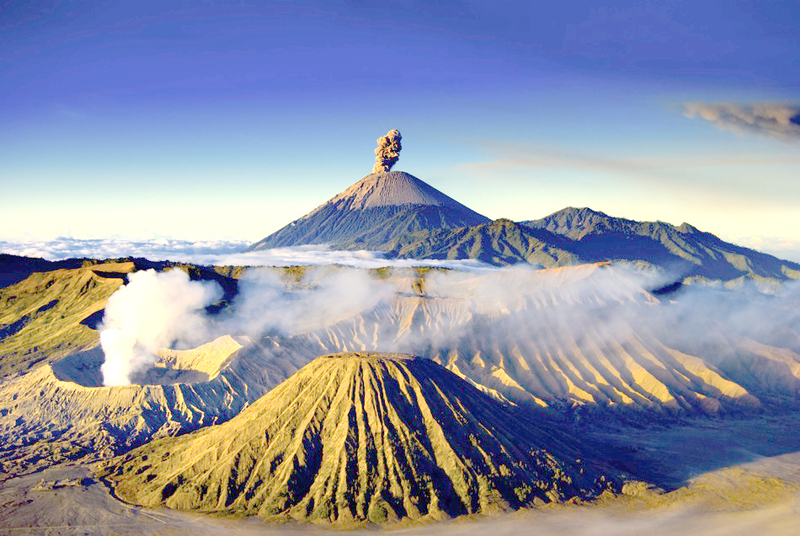 Mount Bromo is an active volcano and the crater inside constantly belches white sulfuric smoke. it has an altitude 2,329 meters above sea level and temperature about 15 - 20 degree centigrade at day tie and 05 - 10 degree centigrade at night. This volcano is the most popular tourism object in Java Island due to has hishest peak as the best place to see Mount Bromo sunrise, Crater, Massive Sea of Sand, Sunset Photography and Mount Bromo Stargazing until tobe the main destination for domestics and foreign visitors. Bromo volcano settled in inside the massive tengger caldera with a diameter of approximately 10km and surrounded by the Laut Pasir (Sea of Sand) of fine volcanic sand. The major access point to Mount Bromo, tengger national park is from Cemoro Lawang, Ngadisari village or at the northeastern edge of the caldera, but there are also trails from Tosari (northwest) and Ngadas (southwest), the visitors take the road from Tosari or Tumpang village, when they visit this volcano form Malang or Pasuruan city. It is located in Cemoro Lawang of Ngadisari village on the road from Probolinggo about 5.5 kilometers, marks the entrance to the national park. Both Cemoro Lawang and Ngadisari are rather picturesque, with brightly-painted houses and flower beds outside. During at 15th century, Princess Roro Anteng (daughter of the Majapahit King Brawijaya) and her husband Joko Seger fled marauding Islamic forces and ending up in safety. Here they developed a new kingdom namely “Tengger” using parts of their respective surnames. The Kingdom of Tengger transformed into prospered and their religion flourished, but the royal couple were unable to produce an heritage to the throne. In desperation they prayed and meditated on this volcano for many days before the crater opened and the almighty god Hyang Widi Wasa announced that they would be given 25 children, with the condition that the last child named “Kusuma” must be sacrificed to the Crater. After 25 children were produced in last year later, Roro Anteng and Joko Segger broke their god condition and refused to sacrifice their last borne Prince Kesuma. Eventually, a dreadful eruption followed and swallowed Kesuma into the crater. To appease the great God, Kesuma’s brothers and sisters held an offering ceremony at the crater once every year until today namley “Kasada Ceremony” and celebrated on Bromo East Java, Indonesia on the full moon of the 12th month according the Tenggerese calendar. If you are interested to enjoy Kasada Bromo, You can make a booking within 2 months before. Mount Bromo East Java has an extraordinary attraction until popular as the icon of Java Island, not only domestics visitors enjoy the beauty of Bromo but also from all the world, before you decide to make vacation to this mountain, you can choose Mount Bromo private tour package or sharing tour in travel agency in Surabaya or Malang, then you can make your booking. If You are interested to visit Mount Bromo - Tengger National Park, You must make a booking within 2 months before because this volcano always heavy of visitors. detail information about Mount Bromo tour price, facility, accommodation and other necessaries, You can visit Our Contact.